Here you can enjoy the extreme thrill of shark diving with both oceanic black tip sharks (year round) and tiger sharks (in the summer season). This is one of only a very few places in the world that you can get into the water to go shark diving with no cage, if you want to. The day kicks off with a hot drink while you hear a very detailed briefing about the shark diving day about to unfold in front of you. After a supercharged surf launch you will find yourself in the warm blue waters staring into the cat-like yellow eyes of up to 30 sharks as they feed and flip around you. If you’d like, you can start off in a cage and you can stay in there if you like. However, most people don’t stay in the cage. When you see how friendly the sharks are you’ll most probably be joining the other divers in the water. End the day with a drink and delicious sandwiches as you wait for your personalized video of the experience. Shark diving like this is not limited to SCUBA diving and in fact many divers choose rather to snorkel to get the best shark interactions. The close nature of this interactive experience that can be enjoyed by the whole family, gives it the number one spot. The Sardine Run is the incredible natural phenomenon of millions of sardines moving up the Southeast coast of South Africa to spawn during the winter months of May though to August. Shark diving can be enjoyed as the teeming masses of sardines are generally accompanied on their long journey, by many feeding mammals and apex predators. You can dive with bronze whalers, mako sharks, oceanic black-tips and dusky sharks, and often a combination of all of those in one day. Taking a week to enjoy the sardine run is a lifelong dream for many and it’s a trip that will be imprinted in your mind forever. The sound of the gannets whirling and diving, the seals barking, the dolphins whistling and popping, the humpback and brydes whales spurting- all mingle together to give the senses a total smorgasbord. 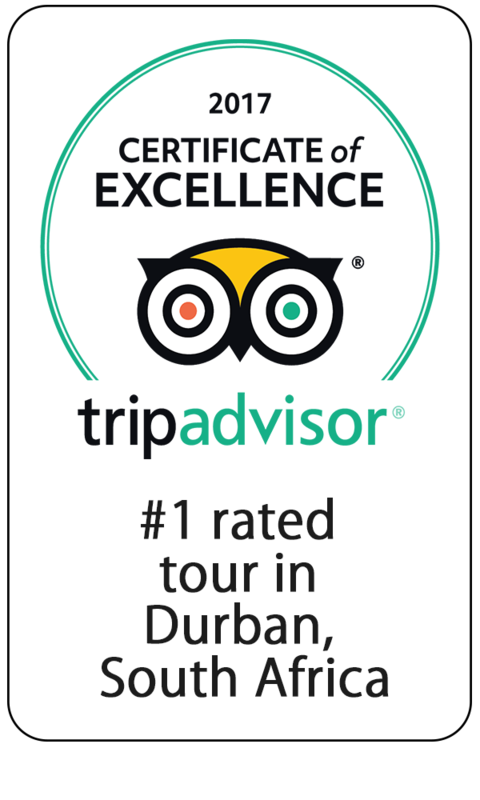 This is one of the best known and best loved shark diving events in South Africa and for this reason it ranks high, at number two on the list. Mossel Bay is a quaint village on the gorgeous Garden Route of South Africa. It is also home to one of the most feared and revered sharks, the great white shark. This sleepy hamlet belies the fact that there are up to 200 great white sharks cruising around its bay at any one time. 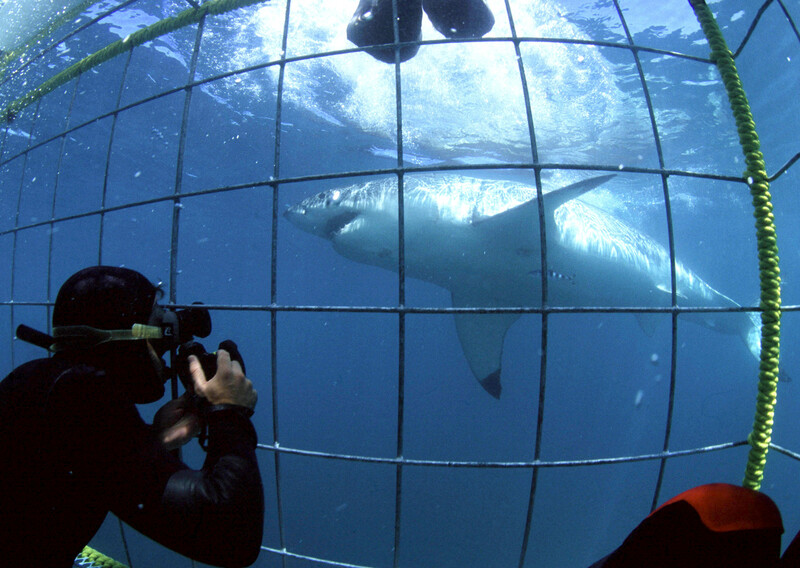 The sharks are in the area all year round and so it is the perfect place to do some shark diving from a cage. You begin the experience with an instructional video and a hot drink. The boat is luxurious and the ride out the shark diving area is gentle and easy, as there really aren’t any waves to speak of. You’ll probably hear the patrons gasp in awe before you see the shark yourself; such is the magnificence of these huge fish. You will be given a warm wetsuit before you jump overboard! The great white sharks are bought close into the side of the boat near your cage and you will probably find yourself staring right into the toothy grin of one of the most incredible icons you may ever see. For the easy professional way in which the cage diving operator gets you close to the king of sharks, this type of shark diving bags third spot. If you don’t want to get wet you can still enjoy the sharks of South Africa. 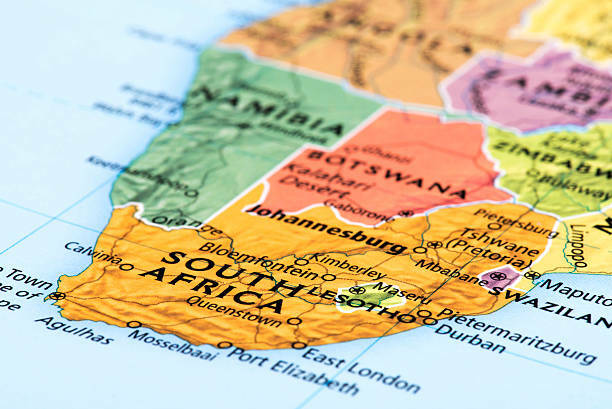 Almost every visitor to South Africa goes to Cape Town. 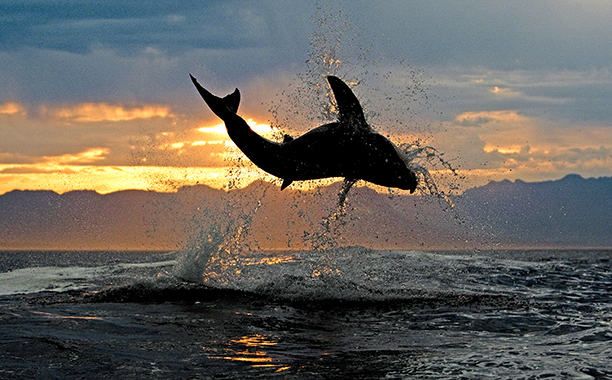 It is definitely worth taking a trip to see the flying sharks of False Bay. Most of the sharks you will see flinging themselves out of the water are great whites in excess of 4 meters and weighing in at over 1 ton. Also dubbed ‘Air jaws’, breaching is one of the hunting techniques used by this species to surprise and kill their prey. From mid-April to the end of August is the best time to do this type of ‘shark diving ‘ in South Africa. You’ll leave the harbour early in the morning, as this is the time the sharks hunt the Cape fur seal. The activity lasts for around 2 hours. During this trip you can also SCUBA dive or snorkel with the sharks but also in a cage. Due to the unforgettable image of seeing a massive shark fly through the air like a bird, this shark diving trip receives the fourth spot. Some people are surprised to hear that manta rays are a close relative of sharks as they are cartilaginous elasmobranch fishes. Neighbouring South Africa is the tropical paradise of Mozambique. There are a few places to dive with mantas but one of the best is at Zavora. 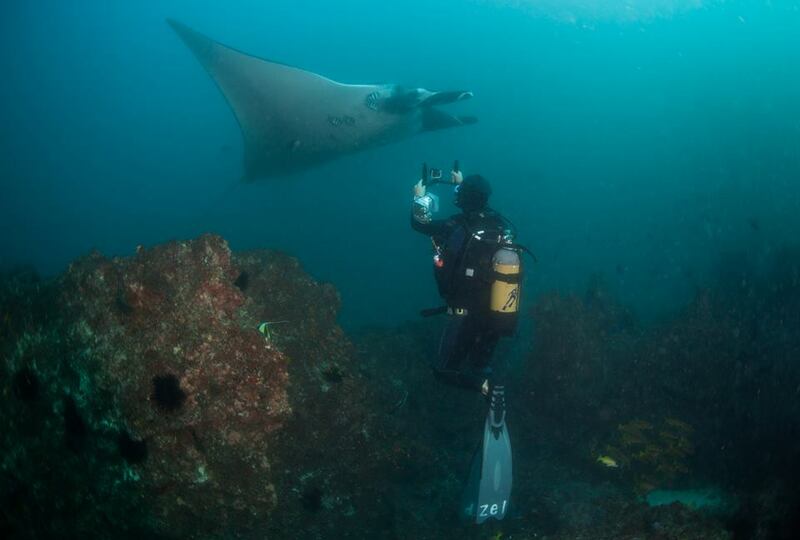 The upwelling of nutrient rich water that circle this bay seem to keep the mantas in the area. There is an easily accessed and shallow dive at Zavora called ‘Witches Hat’, where you are virtually guaranteed to see mantas. The grace and beauty of these gigantic fish is legendary and for that reason ‘shark diving’ with manta rays slots into an easy five on the list. Swimming next to the huge mouth of a whale shark is mind-blowing. 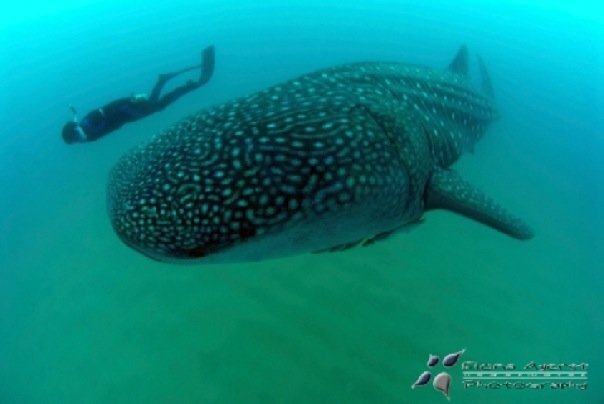 If you snorkel next to them as they feed on plankton near the surface, this is the easiest way to view whale sharks. However, if you are SCUBA diving in Tofo over summer (October-April) they are so prolific in the area, that you may get a visit from one of them while you search the reefs. A dedicated whale shark outing is a chilled and happy affair. The thrill of seeing the sharks fin break the surface or the skipper whooping “ WHALE SHARK” is enough to make the sourest person break into a sweat of anticipation and sheer delight. Perhaps this shark diving experience should be at number two but because they don’t have teeth whale sharks move down the list a little! Bull sharks receive bad press as the meanest of sharks. Perhaps this is due to their quintessential ‘sharky’ look. With their torpedo shaped bodies and blunt square noses they exude power and fearlessness. Shark diving with bull sharks can be frustrating as they tend to spend a lot of time swimming under you, not liking the surface much. 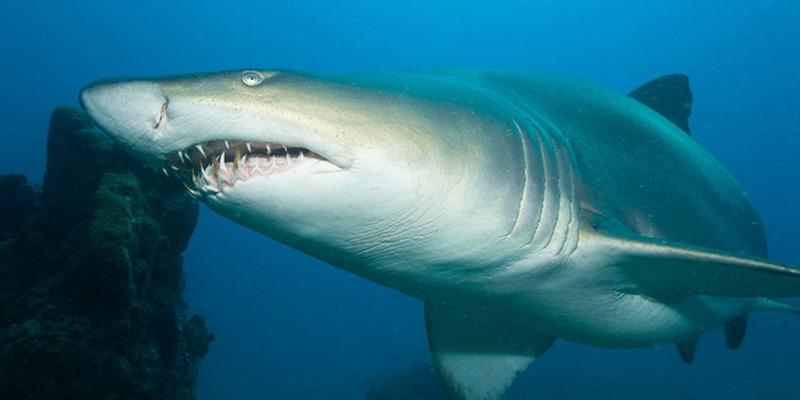 If you are lucky enough to look into the face of a bull shark, you will see bright yellow eyes and a grinning mouth. They are the ultimate predator and built to clean the oceans. Protea banks in South Africa is a pinnacle rising up from the sea bed and favoured by sharks due to the large amount of pelagic fish for them to hunt, so it’s one of the best places in the world to shark dive with them. For their dominion over this watery world, bull shark diving holds seventh place. Protea Banks has its fair share of large sharks but on occasions you’ll get to see schooling hammerheads – the ultimate thrill for divers. Something that humans find endearing about hammerheads is the extraordinary flattened shape of their heads. This ‘ hammer ‘ that gives the shark its name, is known as the cephalofoil, and allows the shark enhanced vision and sensory perception. 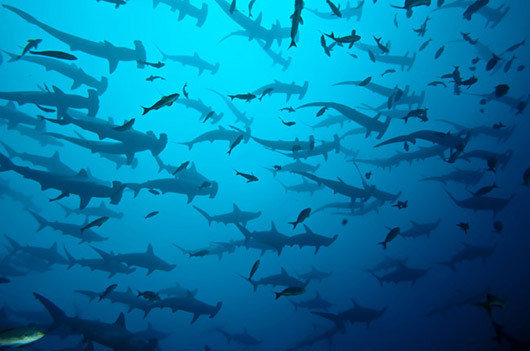 Seeing up to 300 hammerheads passing by you is a vision you will enshrine and revisit in your memory banks forever. The surf launch at Protea banks is ‘ not for sissies’, given the strange shape of the harbour here, a rather large surf break is created and if you like rides at the fun fair them this is definitely a shark dive you should try. It’s for the surge of the electrifying surf launch that this shark dive takes spot eight. Ragged tooth sharks (affectionately know as raggies in South Africa) are also called sand tiger sharks. They have to be one of the calmest, most cool dude sharks you will ever have the delight of doing a shark dive with. In the winter months of June through to September you can do shark diving at South Africa’s Aliwal Shoal with raggies. There is something surreal about floating across the reef and bumping into resting raggies along the way. Raggies have an elongated arrow like appearance but what makes this shark dive number nine on the list is the way their teeth stick out, sometimes at right angles to their mouths. Their appearance makes raggies look, erroneously, like one of the most fearsome sharks in the ocean. In fact, they are supremely gentle to dive with and a definite recommendation for beginners to the shark diving world! If you love wide-open spaces and the big blue and having a lot of fun, then this full day (8-9 hours) out on the ocean is a must do when you visit Cape Town, South Africa. The warm clean waters of the Agulhas current make for great conditions for blue and mako shark diving. These trips run offshore from November to February. The trip out to the shark diving area is fascinating as you pass by Cape Point, home to numerous shipwrecks and boasting a promontory of exceptional wildness and beauty. 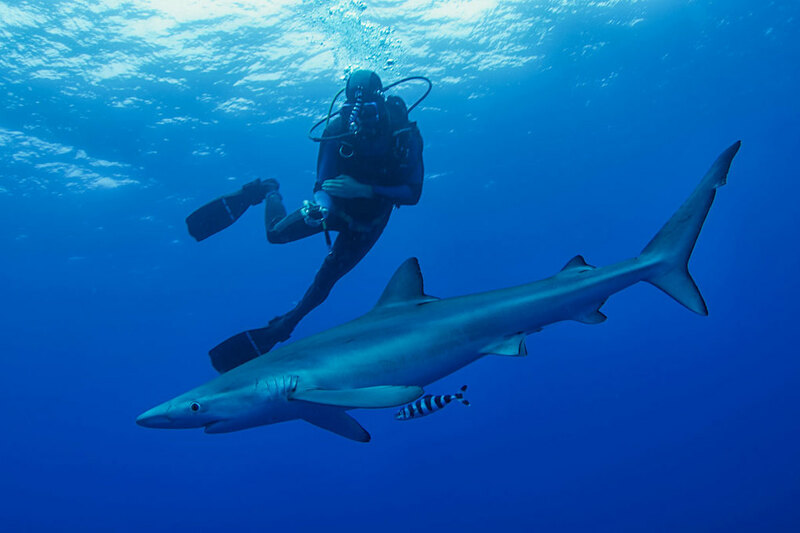 Blue sharks are like little puppy dogs. They are inquisitive and friendly and love to swim between your legs if you are outside of the cage. There is a cage provided for those that want. Mako sharks are like tightly sprung coils; their lithe muscular bodies seem bullet-like as they propel themselves forward darting unnervingly through the water. This full day adventure only takes tenth spot because one of them has to! Previous postShark Jobs – 10 dream jobs that can get you working with sharks!